If you’re shopping for an on-trend wedding band, then look no further than the curved diamond wedding ring. A band with a gentle curve in gold or your favorite precious metal forms the foundation of this ring. The precious metal of your choice is covered in a multitude of sparkling diamonds that make their way around the perimeter of the band. Available in a wide variety of metal types and diamond colors, this gorgeous ring is a perfect way to make a heartfelt statement about your marriage while adding custom flair to match your style. 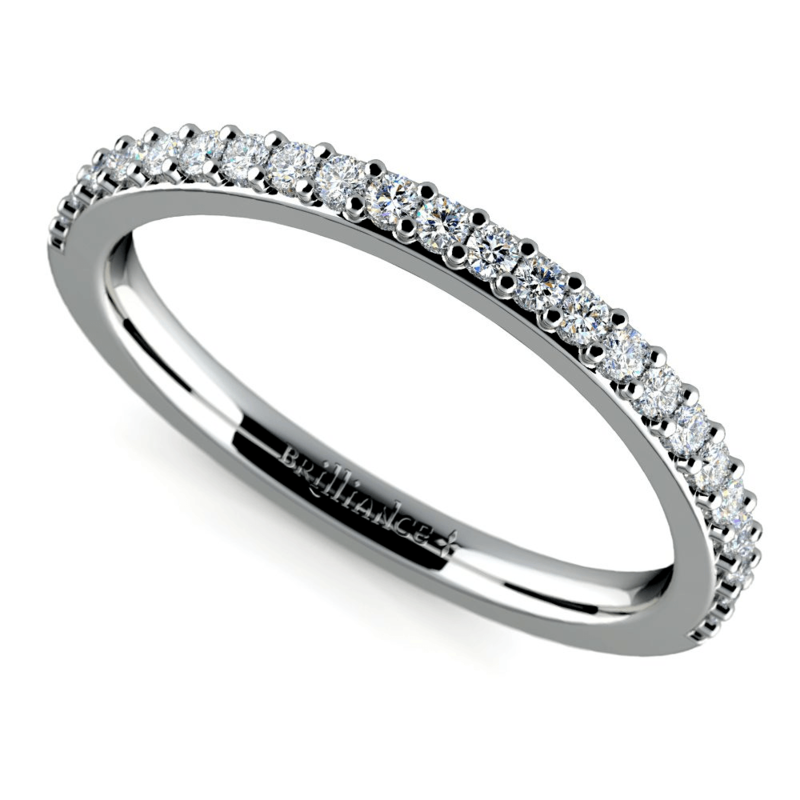 This special ring falls under the half-band style of the eternity ring trend. Diamond eternity bands are on trend because they symbolize the forever nature of your relationship and your marriage. Many couples wait until a significant wedding anniversary, such as the 5th, the 10th, or even the 50th, to celebrate with an eternity band. But, there are no hard and fast rules, so you don’t necessarily need to wait to purchase a curved wedding band. You should choose an eternity band when you feel the time is right, even if that means right away. After all, there’s nothing more romantic than telling your significant other that you want to be together for an eternity! Because the curved diamond wedding ring only features diamonds along the top side, it’s easier to stack with your engagement ring, and is more comfortable for everyday wear. 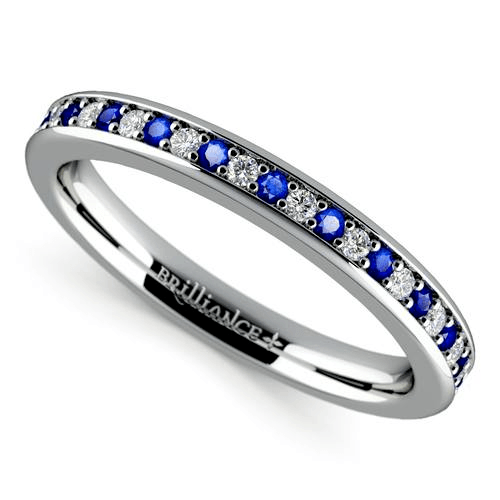 Many couples opt to wear half-band eternity rings like this one because of the daily convenience factor. The curved diamond wedding band is by far the most popular choice for couples who live active lifestyles or work with their hands. Some women love the simplistic look of a plain wedding band. But if traditional, simple women’s wedding bands aren’t quite your style, then you’ll love the sparkle and glamour that the curved diamond wedding ring offers. The white gold and round-cut diamond model includes 23 brilliant diamonds for a total carat weight of ¼. A ring like this will have an intense sparkle and shine, so you’ll turn heads from across the room. You’re in control of the design, so you can choose a model that has exactly the amount of bling that you want… even if that means all of it. Many brides do not want an overly traditional ring, however they still want a ring that is designed with some traditional elements. Does this sound familiar? If you’re the type of contemporary bride to mix and match floral arrangements or DIY the centerpieces, but still walk down the aisle in white, then the curved diamond wedding ring is the perfect blend of tradition and modern aesthetic. Add your own personal touch to the curved wedding band of your dreams. You can include colorless diamonds and yellow gold to hold closer to tradition, or mix it up by adding other gemstones in, retaining as much tradition as you want to keep, or going as nontraditional as you’re comfortable. The choice is yours–all that matters is you wear your curved diamond ring with pride and let it speak volumes about your personal style. Looking for a wedding ring that is designed with precious metals or colors that are important to you? Look no further than a curved diamond wedding ring. Choose this ring style in the metals and diamond colors that you want for a personal statement. Prefer contemporary white gold and classic colorless diamonds? You’ve got it. This classic design will stand the test of time, so you can continue to wear your stylish wedding band for decades to come. 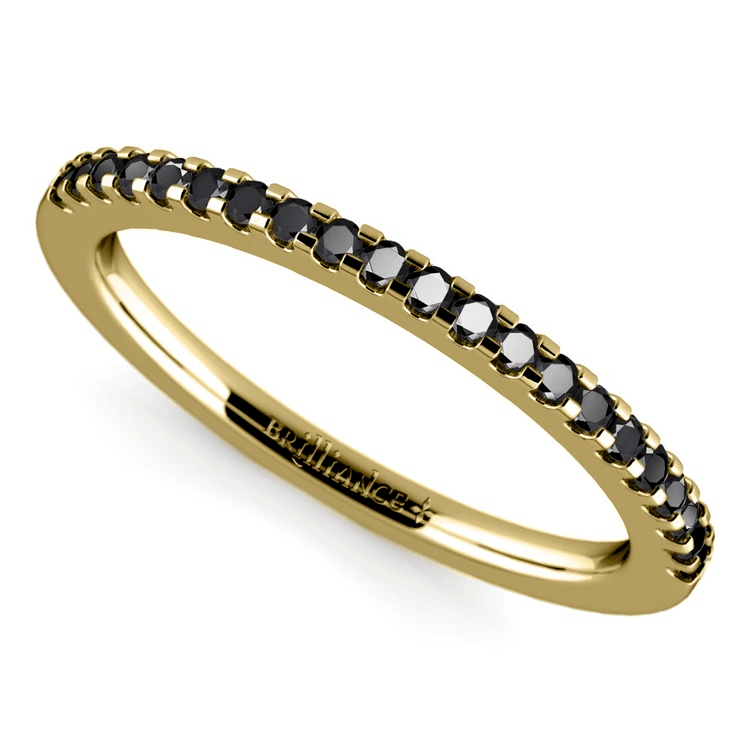 What about the high contrast look of yellow gold and black diamonds? It’s an option. You can also set a new trend by mixing and matching different colored diamonds within your band. Or, consider using both diamonds and other brightly colored gemstones like emeralds and rubies. These are both great ways to incorporate your favorite color, birthstone, or a gemstone that is deeply meaningful to you. The options are endless so there’s no need to settle for a ring that’s anything less than “you.” Flex your creative muscle and design a ring that perfectly expresses who you are! These are five of the many reasons why a curved diamond wedding band is the perfect choice for you. 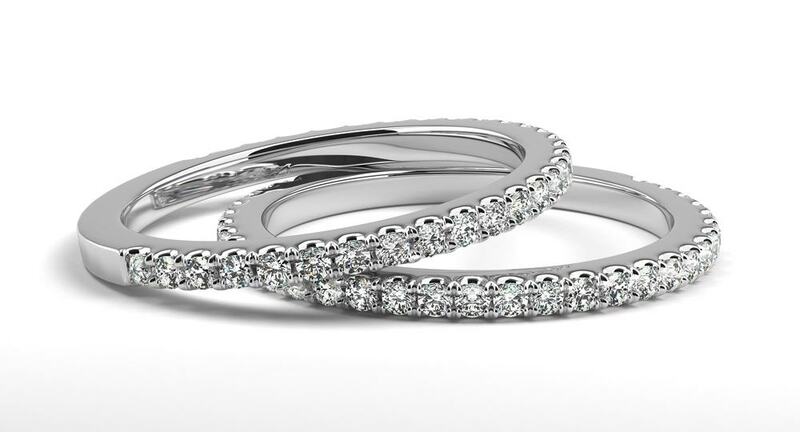 One thing’s certain: the curved diamond wedding ring is trending for a reason. Whether it’s as an eternity ring; part of a past, present, and future set; or just because it’s the right ring for your marriage, this ring makes a stellar addition to women’s wedding ring sets.